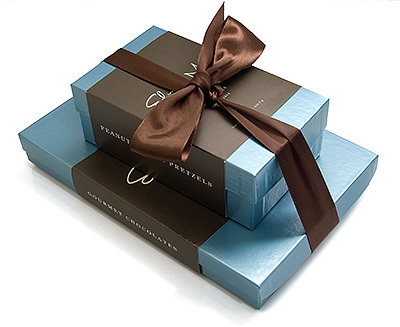 Looking for a gorgeous chocolate gift? Whether you’re treating yourself or someone else, Edward Marc has some lovely goodies to share with you. I recently received of a box of Edward Marc gourmet assorted chocolates and a box of chocolate peanut butter pretzels to review. The first thing I noticed was the packaging. It’s very classy and elegant, without being stuffy. My immediate thought was “Ooh, this would make a nice gift!” When I opened the box of chocolates, I was delighted to see that the inside was even prettier than the outside. Looks are all well and good, but what about the taste? I can tell you that Edward doesn’t skimp on flavor or texture. There’s a mix of solid chocolates and filled chocolates. The white, dark, and milk chocolate shells were consistently rich and creamy, so no matter what filling you got, the chocolate was always great. Plus, there’s a nice variety in the fillings, including fruit, nuts, and creams, so there’s something for just about everyone. I really liked the Golden Raisin Cluster – think uber upscale Raisinet. But hands down, my favorite thing in the box was the Dark Chocolate Salt Caramel. OMG! These people have taken caramels to a new level. The caramel is incredibly buttery, just the right amount of chewy, and not too sweet. With the rich dark chocolate and then the salt – who knew salt could add such a wow factor? – I was in heaven. It’s a good thing I didn’t get a whole box of just the caramels or might have had to propose to someone at the Edward Marc factory. The only misses for me had to do with personal taste rather than shortcomings on Edward Marc’s part. Personally, I’m not that into orange peel, so the white chocolate with the orange peel didn’t light my fire. And, I’m not really into the meltaways, but if light, creamy, melt-in-your-mouth fillings are your thing, these will make you swoon. I did, however, really enjoy the roasted coffee beans on top of some of the meltaways. 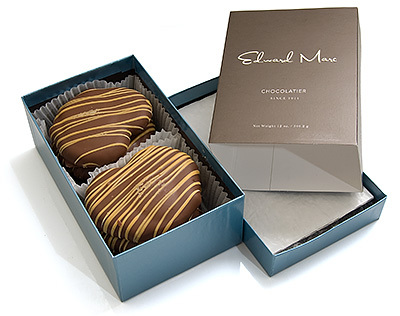 They added crunch and a surprising amount of flavor that really complimented the chocolates. I also tried the peanut butter pretzels. I don’t know what Edward Marc has been feeding their pretzels, but these pretzels are huge! While the pretzels were good, I can’t say I got the same wow that I got from the chocolates. I think this is, again, a matter of personal taste. First, I love salt, and I felt like the pretzels really need salt. Second, the peanut butter had more of the whipped consistency, like the filling in the meltaways which, again, is not my personal preference. I prefer a more solid, less sweet consistency. That said, I still enjoyed the pretzels. The chocolate was rich, the portion was extremely generous, and the pretzels were nice and crunchy. 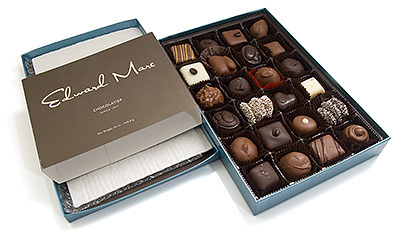 Overall, Edward Marc makes a lovely mixed box of chocolates, in variety, in presentation, and in taste. They also make a good box of ginormous chocolate peanut butter pretzels, with good chocolate and texture. In both cases, Edward Marc doesn’t skimp on ingredients or portions. I can see either or both of these making good gifts. These guys own The Milkshake Shop in Pittsburgh PA. They have a huge selection of milkshakes and other ice cream treat were they use their own chocolates. They also sell the chocolates there. Definitely on my list of places to go. I have recently tried their golden raisin clusters and they are super good….I thing that I like about this company is they have a program where they donate 20 per cent of the sale of any item in their catalog to a charity. I think that this is a wonderfullllllllllllllll idea…..